Saturday, April 21, from 1:30 to 4 p.m. in the Heritage Source Books area at the 40th annual Bunka-Sai, Torrance Cultural Arts Center, 3341 Torrance Blvd. (at Madrona Avenue), Torrance. Sherlock Holmes fans know about the “missing years” — the time when Holmes traveled in Asia after his epic battle with Professor Moriarty. Now, thanks to recently discovered notebooks, some of the great detective’s most challenging cases can be revealed. Holmes is secretly brought to Meiji-era Japan disguised as an explorer named Sigerson. The world’s most famous detective finds himself in a country where he doesn’t speak the language, doesn’t understand the culture, and is faced by evil, both great and small. He must depend on the help and guidance of a Japanese doctor, Junichi Watanabe, who makes wry comments about Holmes’ eccentricities as he helps him solve uniquely perplexing crimes. How can the sound of an obscure Japanese garden instrument help Holmes solve a case of madness and the voice of the devil? Why would a thief risk capture to steal countless jars of pickles? Why would ghostly samurai appear to guard a waterfall? These and other puzzling mysteries challenge Holmes and Dr. Watanabe. 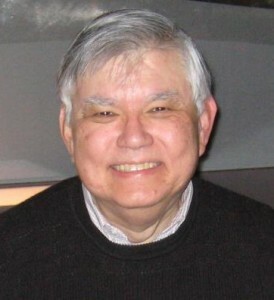 Furutani, a Sansei, was born in Hilo, Hawaii, in 1946. When he moved to California with his family, he met with racial prejudice for the first time, as he was virtually the only Asian in his school. He went on to attend CSU Long Beach, where he received a degree in creative writing, and UCLA, where he received an MBA in marketing and information systems. He worked his way through school, writing articles and serving as a contributing editor for various magazines. He has had over 250 articles published, as well as three non-fiction books about computers, has won prizes for his poetry, and had a one-act play produced while he was in college. Furutani started writing book-length fiction late in life. “Death in Little Tokyo,” his first novel, appeared in 1996. It’s set in the Little Tokyo and Silver Lake districts of modern Los Angeles. It won an Anthony Award and a Macavity Award, and was nominated for the Agatha Award. This was the first time that an Asian American won major mystery awards. In the sequel, “The Toyotomi Blades,” his protagonist, detective Ken Tanaka, travels to Japan. In 1998, Furutani launched a second mystery series, set in 1603 Japan and featuring a ronin (masterless samurai) named Matsuyama Kaze as the detective. The first book in the series was “Death at the Crossroads,” followed by “Jade Palace Vendetta,” which received a coveted starred review in Publisher’s Weekly. The third book, “Kill the Shogun,” the third book in the series, was on the Los Angeles Times’ fiction bestseller list. Furutani has been a speaker at the Japanese American National Museum, the Wing Luke Asian Museum, the U.S. Library of Congress, the Pacific Asia Museum, the Los Angeles Times Festival of Books, and several conferences and universities. He has also been the subject of a half-hour program on Southern Oregon Public Television, a guest on Italian State Radio and National Public Radio. For over 30 years, Furutani has owned a small consulting company that specializes in the automotive industry. His many clients have included Nissan USA, Nissan Japan, Subaru, J.D. Power and Associates, Land Rover North America, Mitsubishi Motor Japan, Xerox, GE, Oracle Software, PriceWaterhouseCoopers Consulting, Cap Gemini, Ernst & Young Consulting, and Isuzu. He has also served as president of a software company, parts marketing manager for Yamaha Motorcycles, director of information technology for Nissan USA, and CIO of an Internet company. Married over 40 years, and he and his wife Sharon live in the Pacific Northwest, near Seattle. He has spent extensive time in Los Angeles, Portland, Tokyo and Las Vegas. While living in Los Angeles, he and his wife were honored by the city for their efforts to preserve and protect Silver Lake Reservoir. In 2000, Furutani was chosen as one of the “44 Faces of Diversity” by the City of Los Angeles and the Los Angeles Convention Bureau. His face appeared on street banners throughout the city, including Los Angeles International Airport, Olvera Street, and Westwood. Around 2001, while living in Japan, Furutani became ill with the first of several major health problems, including serious infections, peritonitis, and cancer. He stopped writing for several years while his health improved. 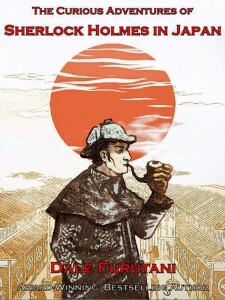 Finally, in 2012, he was able to complete “The Curious Adventures of Sherlock Holmes in Japan,” which is available on both the Kindle reader and in trade paperback. All his prior novels are also available on the Kindle reader. For more information, visit www.dalefurutani.com or check out the author’s Facebook page.